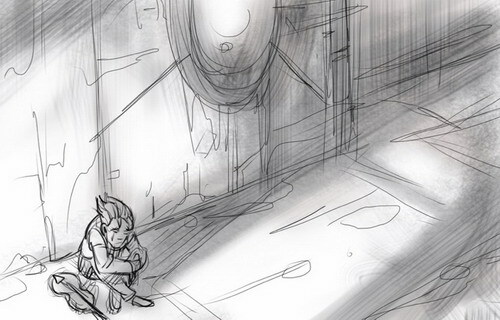 Making a storyboard for a short film means doing between 150 to 200 drawings to tell a story. 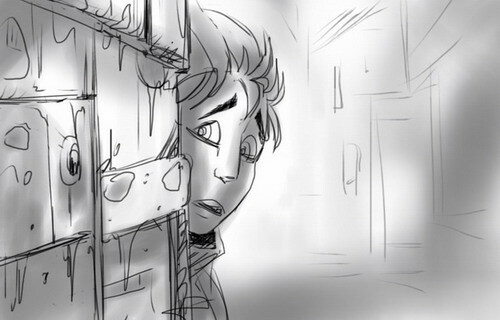 For my current CGI film I decided to try changing my PC/Wacom habits and to use the combined strength of Sketchbook Mobile and Hitchcock apps on my iPod Touch. But would it work like it should? 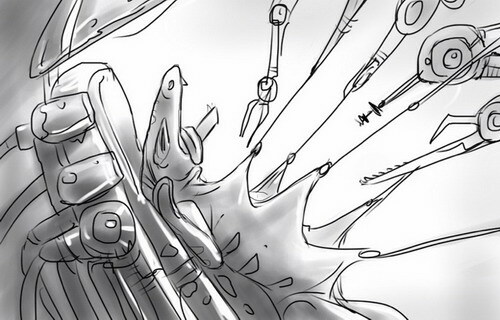 It was very easy to do a drawing test as I had already used for some time Sketchbook Mobile and really appreciated its qualities. At first I was really impressed by how close a result I get to what I usually do on my desktop. With SBM I get the unique combination of layers, high resolution and beautiful lines for my drawings. It’s really fast to rough out and polish drawings for quick import in the editing application and the drawings look almost as good as on my Mac or my PC. 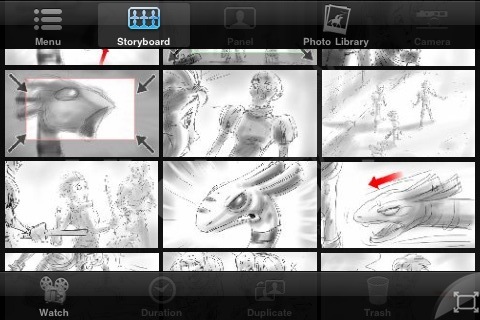 I usually use that app for color work and drawings for storyboards need to be done a bit differently. Here is how I proceed: I use a first layer for very rough pose, angle and background setup with a very light gray single pixel pencil. I add another layer on which I clean the drawing with a dark size one (thicker for close ups on characters)pencil and go back after that to the light gray rough layer. I erase it and use then that layer for light shadings. For this step I use the main brush (sometimes the airbrush) on the Marking Menu with various tones of gray to obtain contrast and mood. That’s basically it for the drawing part. Enter Hitchcock, which is not the cheapest app on the store(15.99€) but as a tool aimed at professionals it is after all moderately (I could say very cheap compared to Premiere and the like…) priced. But it had to work for my needs… Once bought, I very quickly saw the potential and took my decision, this could work! But the real question was to finding out if it could hold the whole board? To be honest, Hitchcock is still missing some important features I would need for this type of work, like fade to black, cross fades, more elaborate camera movements with rotation for example, but globally it works fine for a first version and it gets the job done, which is essentially timing each frame of the board with a constant eye on the whole project(with sound if needed). I can only hope they will implement the missing features in the next upgrade. I’m now reaching the end of my board with around seven minutes worth of boarded film and the app is still playing smoothly in one single chunk all my drawings! This entry was posted on Tuesday, October 20th, 2009 at 13:25and is filed under . You can follow any responses to this entry through the RSS 2.0 feed. You can leave a response, or trackback from your own site. Thierry, that is execptional. The app, the post and above all you work. I am so impressed with how quickly apps are making this little machine function as well as the laptop or desktop. It’s certainly mobil and Thierry shows us how professional it is too. Beautiful work too thierry, you are a master at making us believe we are in another world. Surround by fantastic creatures and life. Bravo. great post! I will share this with some of my animation friends. I am hoping to better utilize my iphone/fingerpainting skills for my job when i start development of 2010 product and toy designs in December. Hardly amazed for this post Thierry. 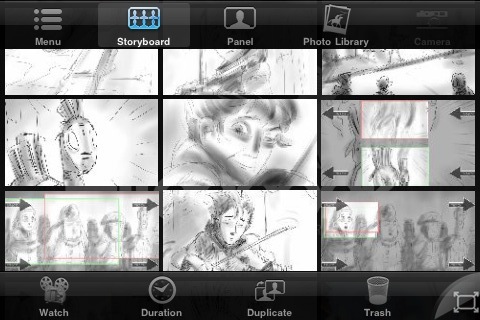 It was great if we can view the final video of the storyboard. Thanks Bristles, it is I think slightly faster than on the desktop, though on the desktop more sophisticated boards are possible. Matthew, thanks for the nice comment my friend! Glad you like. Dear Susan, thank you for liking my world and work:) Though tiny, this device can be indeed be used professionally for certain tasks, this is one of them and I believe with time we’ll see more other places where it can be of great help. Thanks Kevin, thanks also for spreading the info. Hope we’ll see what you will come up with.